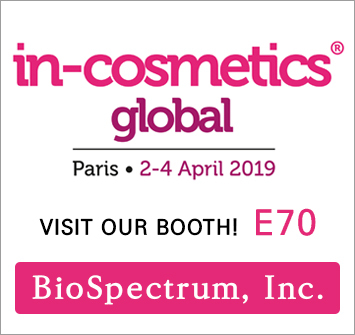 BioSpectrum, Inc. will attend this year’s In-cosmetics Global held at Paris expo Porte de Versailles, Paris, France from April 2nd to 4th, 2019. In-cosmetics Global is the world’s the largest personal care ingredient exhibition. In the recent event brought 773 companies and 9,392 visitors. Attracting more participants every year, the exhibition provides the great opportunity for the business networking in the personal care market. In this year, BioSpectrum participates the exhibition with our strategic partner, CLARIANT, as a joint booth. In-cos LATAM innovation award winner, Eosidin from 2017, Nobel prize-inspired innovative active ingredient, B-Circadin from 2018, and stay tuned for our new active ingredient which will bring another innovation to the market in 2019!